The .22 long rifle is the most popular and widely produced firearm ever. The reasons for it's popularity are numerous but I think the main one is they are just pain fun to shoot. And given the fact both the ammo and gun are so affordable this makes it the ideal gun for plinking or small game hunting. But where did this awesome cartridge come from? The earliest beginnings of this little cartridge can be traced back to its even smaller predecessors and probably owe a lot to Smith and Wesson. The earliest .22 caliber rimfire cartridge was the Flobert 22 BB cap and was initially created by pressing a .22 caliber round ball into a rimmed version of a percussion musket priming cap. 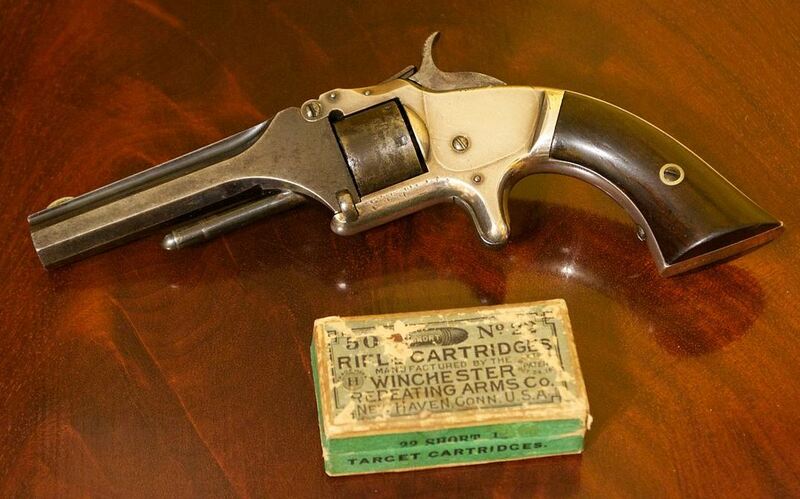 This cartridge was first introduced in 1845. These were used primarily in "Parlor" or gallery rifles and pistols which were actually used for indoor target practice and recreation, much like a dart board game would be used today. At some point these fell out of favor for indoor use probably after some unlucky participant put his eye out or damaged the parlor decor. Think of them as the Yard Darts of the 19th century. They were also used for killing "small pests" which either means small rats or large roaches, that must have been great fun! No need to leave the house for the thrill of the hunt just sit in the "parlor" and wait for some unlucky vermin to come along. I wonder if they ever baited the field with a bit of cheese or bread crumbs. Or if you really insisted on going out of doors there was always the veggie patch where you might even bring down a crow or take out a small bunny with a well placed shot. You'd probably just put his eye out though. Okay that's the last Christmas Story reference I promise. As the parlor gun craze was drawing to an end in rides Smith and Wesson to the rescue. In 1857 the .22 short was developed specifically for the first Smith and Wesson revolver the Model 1. The new .22 short had a longer case than the 22 BB and packed a whopping 4 grains of black powder. The projectile was also redesigned to have a conical shape and flat bottom. In 1871 the .22 long cartridge was introduced in an effort to provide a little more powerful pistol round than the .22 short. The cartridge case was lengthened and another 2 grains of powder added, the projectile remained the same. The .22 long was well received and soon rifles were also being chambered in the round for use in small game hunting. In 1880 the 22 Extra long cartridge or 22-7-45 was brought to the market to provide and even more effective small game rifle round. This cartridge had a much longer case length and used a 45 grain conical projectile with a 7 grain charge of black powder. There were problems reported with this round quickly fouling up rifle barrels and it never gained popularity. No rifles were manufactured in this chamber after 1916 and the ammo was dropped from production around 1935. 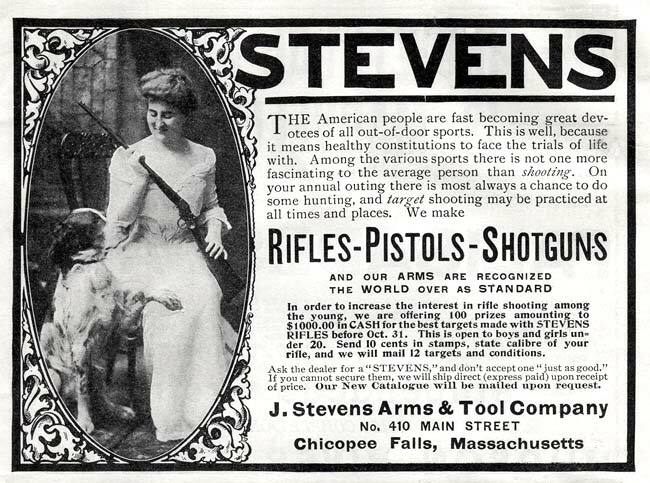 In 1887 J. Steven Arms & Tool Company developed the 22 Long Rifle cartridge. It was based on the .22 long cartridge case but replaced the 29 grain projectile with a 40 grain conical and used 5 grains of fine black powder. Stevens also concluded the heavier projectile would preform better at a faster rifling twist rate and provided this in their rifles. The results were the most miraculously popular cartridge of ammunition ever conceived. Riding on the .22 LR coattails with varying success were three other descendants of the .22 family. The longer and more powerful .22 Winchester Rimfire or WRF was introduced in 1890 along with its twin the 22 Remington Special. 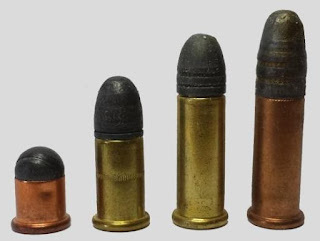 The advent of the high velocity .22 LR cartridge using more efficient cleaner burning powder pretty much killed the .22 WMR as it eliminated the advantages of the longer case. The sheer number of .22 LR chambered firearms and the fact they were cheaper also contributed to the WRF demise. In 1959 Winchester introduced the 22 Rim Fire Magnum which was a success and filled a niche for people who needed something a little more powerful for medium size game. Today the .22 rimfire still remains king of the small caliber realm. Even the recent shortages couldn't lessen it's appeal. If anything it only highlighted it's popularity when people panicked at the very thought of running out of it. I think this is one round that's here to stay.